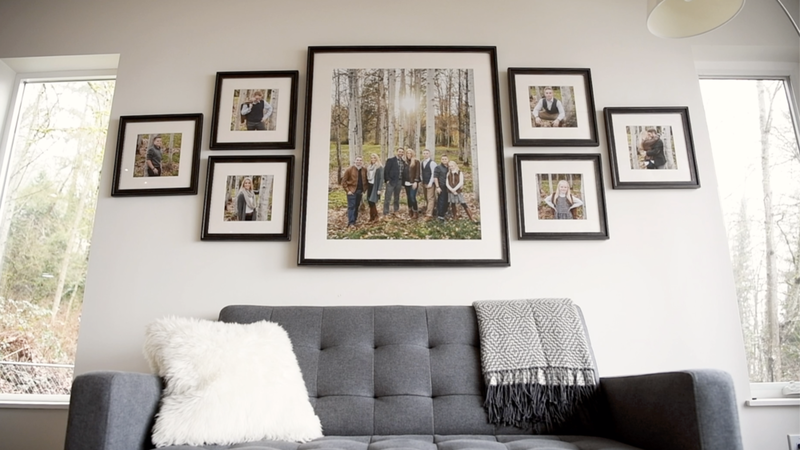 Decorating with Family Portraits so that you can enjoy the people you love in the place you love is what we do best here at Studio B. Seeing a blank canvas come to life with a wall design that compliments your home is seriously a guilty pleasure. This 7 piece series that we created for the Bean Family home turned out so beautifully. We chose a clean museum style display with a slim molding and warm neutral mat to compliment the families mid-century modern motif. In addition to the center showpiece portrait featuring the entire family, we created modern squares highlighting Mom & Dad + each of the kids.